After our one day whirlwind tour of Europa-Park we boarded another train for a short distance journey to the city of Freiburg im Breisgau. Known as the ‘Jewel of the Black Forest’ this laid back small University city situated nearby Swiss and France borders was perfect to explore on foot. We started our walk in the heart of the city while it was drizzling outside. 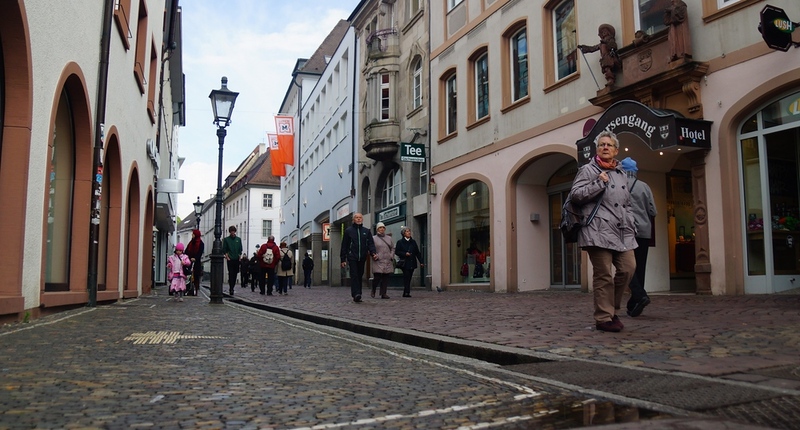 Given that it was Easter Holiday most of the shops around the town were closed but a surprising amount of people – equipped with either rain jacket or umbrella – were braving the elements. With many of the many architectural landmarks located within 15-20 minutes walking distance from one another (using Münster cathedral as the central focal point), we enjoyed walking along the cobblestone sidewalks while noticing many locals out on their bikes using the dedicated bicycle lane. 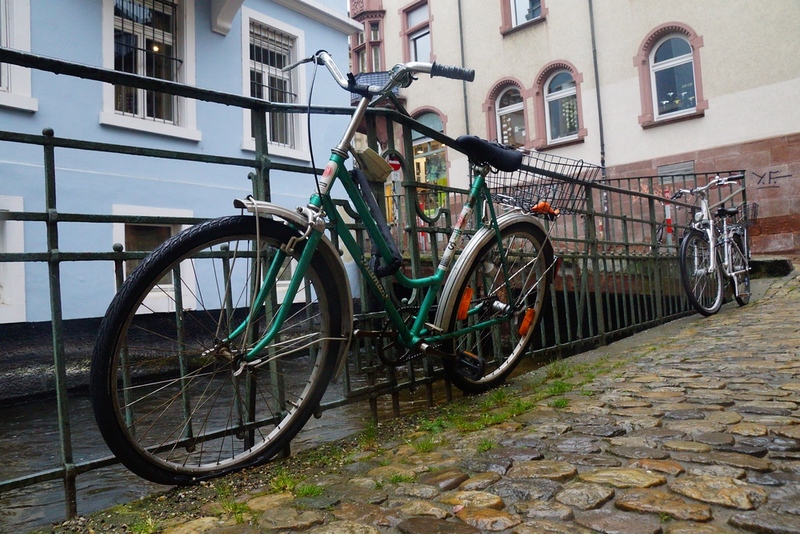 It was charming to see more people out and about in a casual manner – walking and bicycling – winding around alleyways and canals (known locally as Bächle). 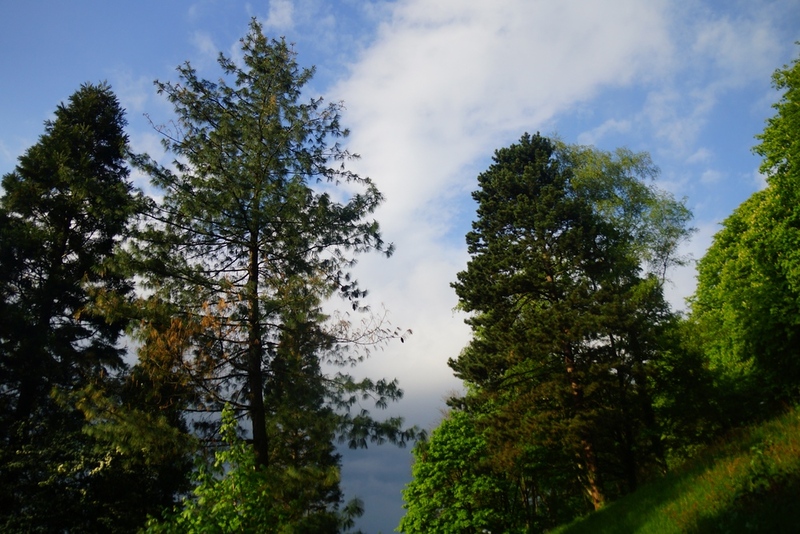 After taking a brief siesta in the afternoon, we ventured outside once again; however, this time the stormy clouds had displaced and the sun shined brightly. Taking advantage of this wonderful pocket of good weather, we hiked all the way up to the Black Forest where we were treated to the best views of the city from a high vantage point. Prior to leaving, we had dinner at Martin’s Brau where I had the privilege of sampling the best spaetzle I’ve ever had anywhere. Spaetzle, for those unacquainted, is a type of egg noodle dumpling (with a pasta-like texture) that is especially popular in southern Germany. Unlike what we had in Berlin, this wasn’t covered as much in layers of cheese but the quality of spaetzle itself (covered in a creamy mushroom sauce) tantalized my taste buds. Known literally as little sparrow’ I could certainly get used to eating this dish frequently. I got the sense that this city is kind of under-rated in terms of tourism. Although, it doesn’t have major attractions like Berlin or standout castles like Heidelburg, I certainly enjoyed my time here wishing I had an extra day to explore more on foot. 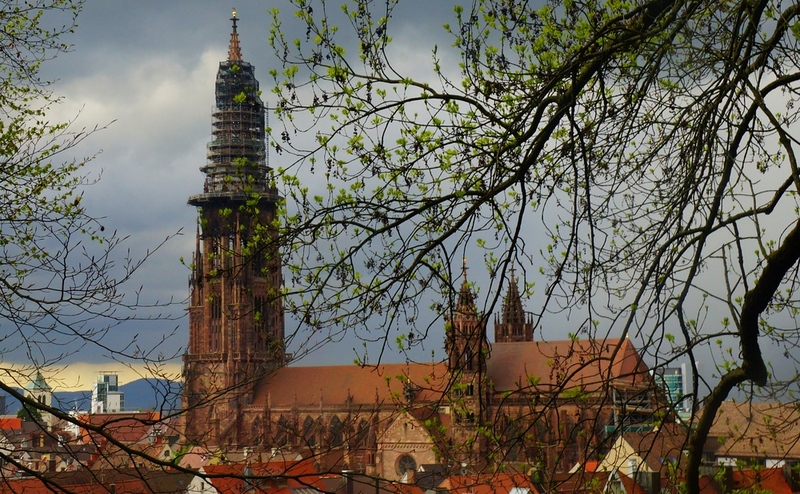 If you’re nearby Frankfurt or Heidelberg, I definitely recommend considering spending a day or two here as a way of avoiding the tourist hoards. Given that it was rainy outside and it was Easter Holiday there were a surprising amount of people out and about. 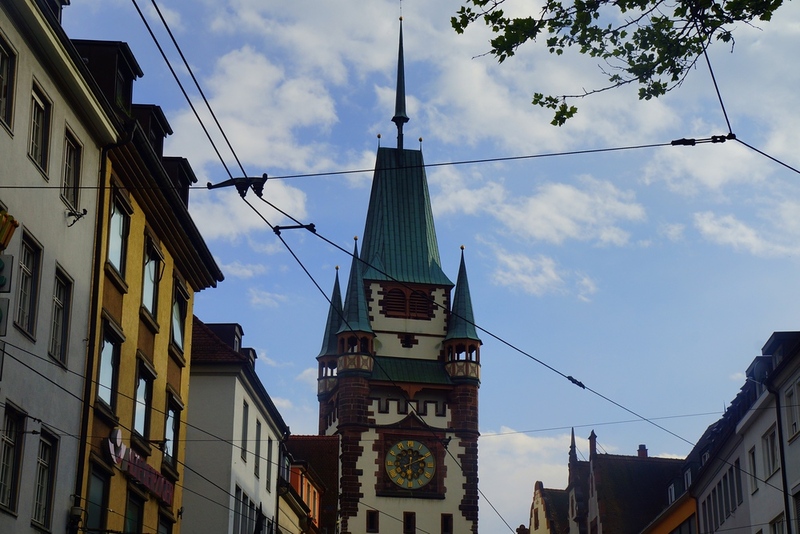 The Old Town Square of Freiburg was an ideal place to walk around. 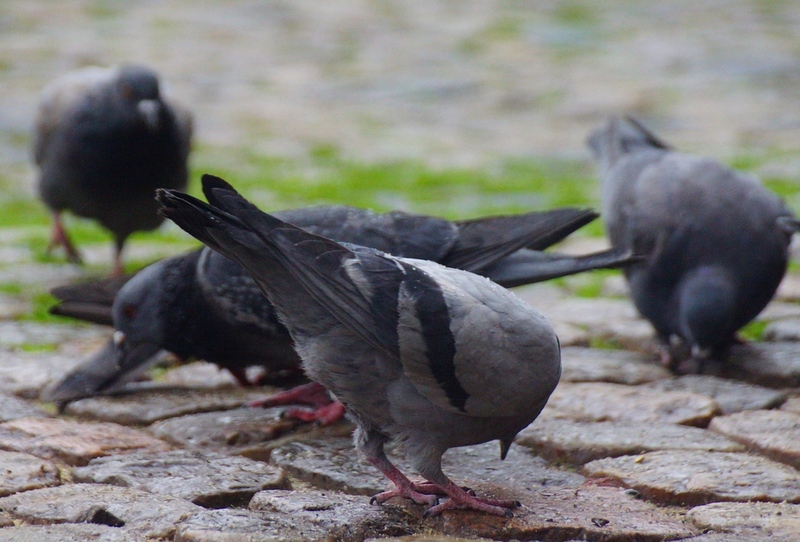 Pigeons feeding in Freiburg, Germany. 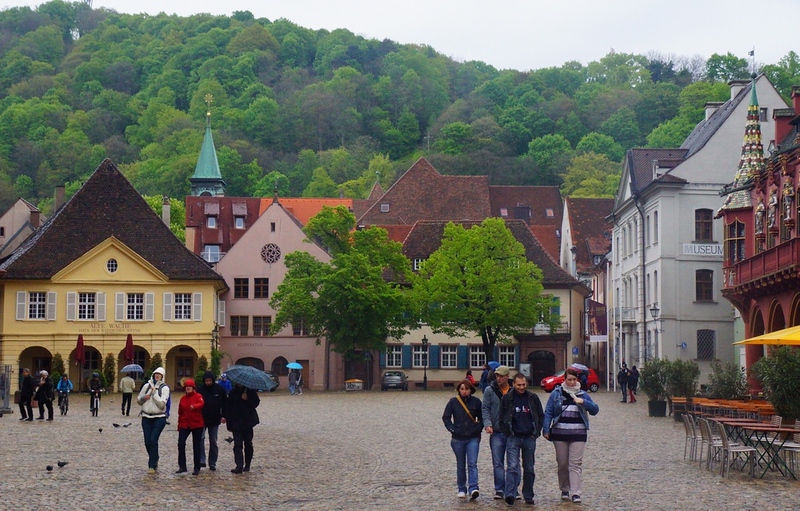 Another shot from the Old Town Square with the Black Forest in the background. 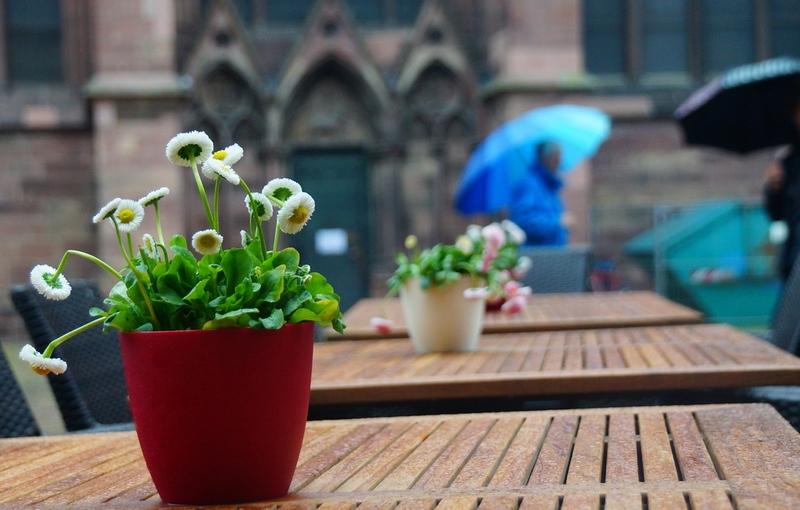 Flowerpot sitting on a restaurant table with people walking by carrying umbrellas. Rustic scene walking around in the rain in Freiburg, Germany. Bicycles parked alongside the canal. 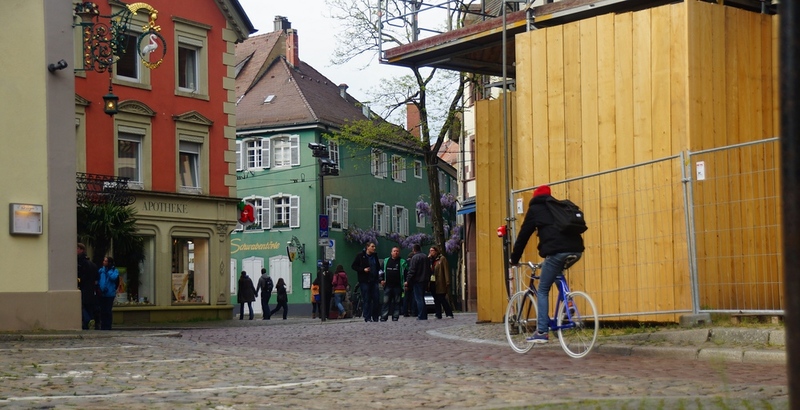 Like other cities I’ve visited in Germany, Freiburg is very pedestrian and bicycle friendly. I wish more countries were this progressive. One thing I love about Germany in general is how bicycle friendly the streets are in every city I’ve ever visited. 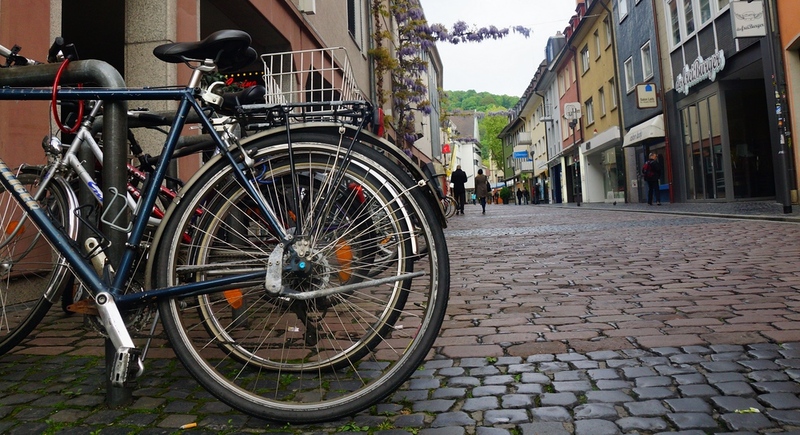 Whether it be Berlin or Freiburg it’s a great idea to rent a bike and explore. 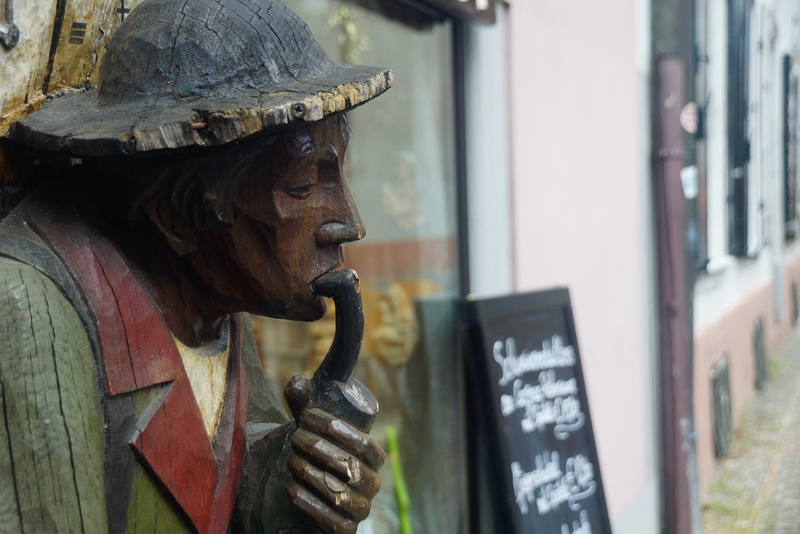 A wooden sculpture of a man smoking a pipe just outside of a restaurant / bar in Freiburg, Germany. 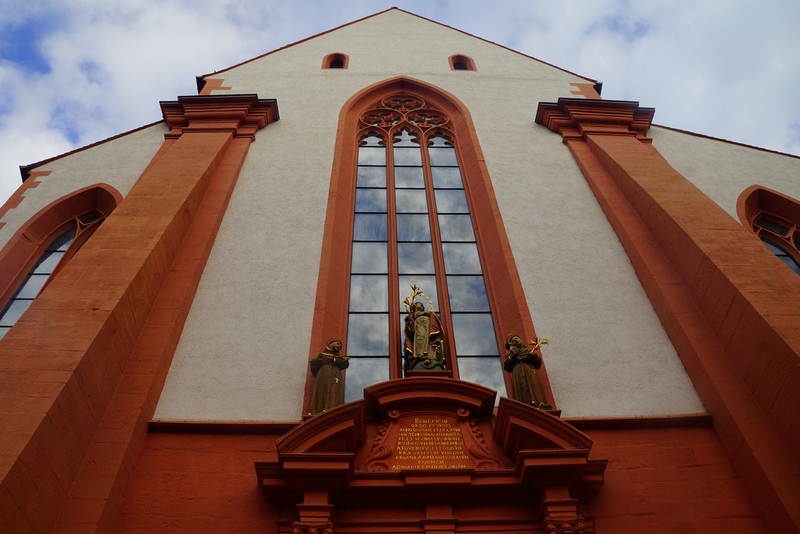 Some of the churches, cathedrals and other old architecture are particularily impressive in Freiburg. As a travel photography tip, don’t forget to look up with a wide angle vantage point. Considering it was a holiday and rainy outside there were a surprising amount of people pounding the pavement. 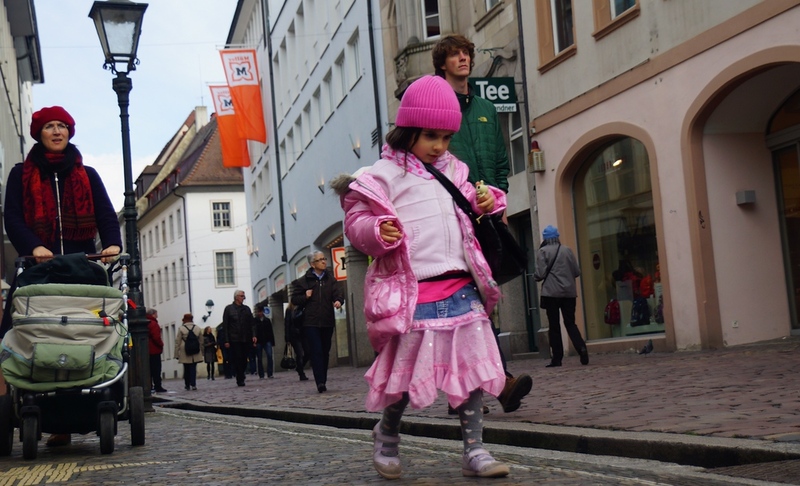 This cute little girl was wearing decked out all in pink. 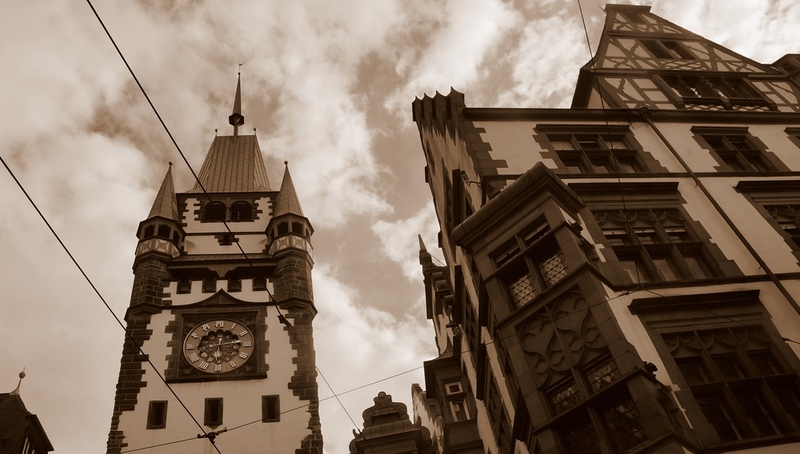 A shot of the clock tower in the central part of the Old town area just as the weather started to improve. 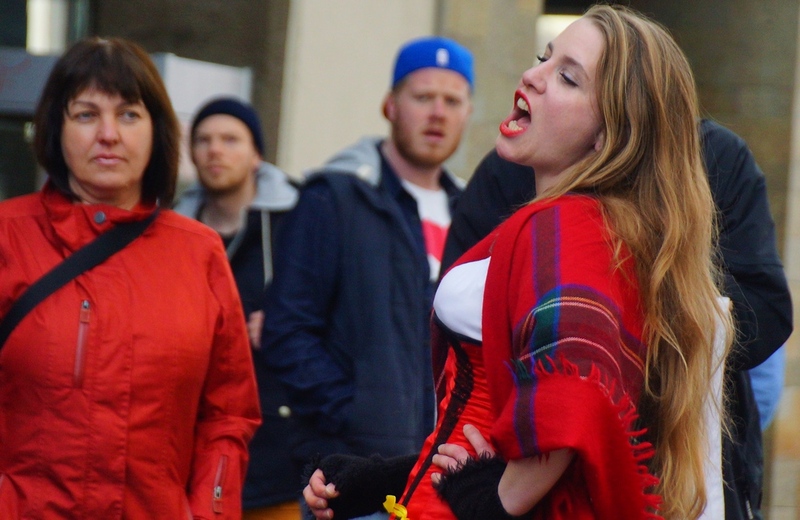 An animated performer flashing a saucy smile while entertaining crowds on the street in Freiburg, Germany. 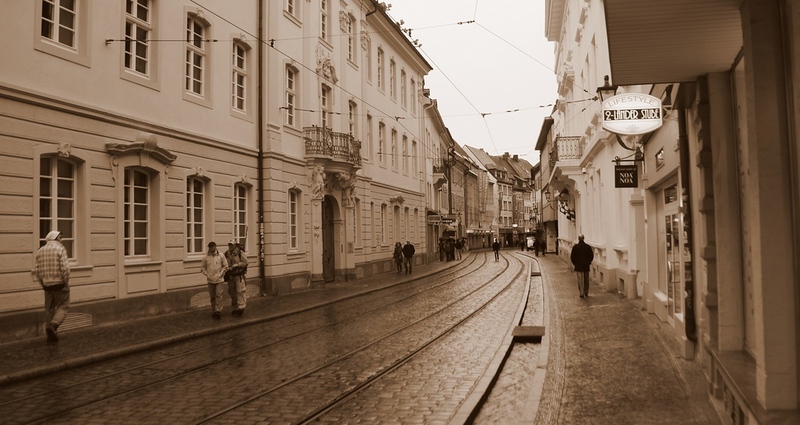 Another sepia shot in the heart of the Old Quarter. Heading out to the forest was a wonderful green escape from the center of the city. 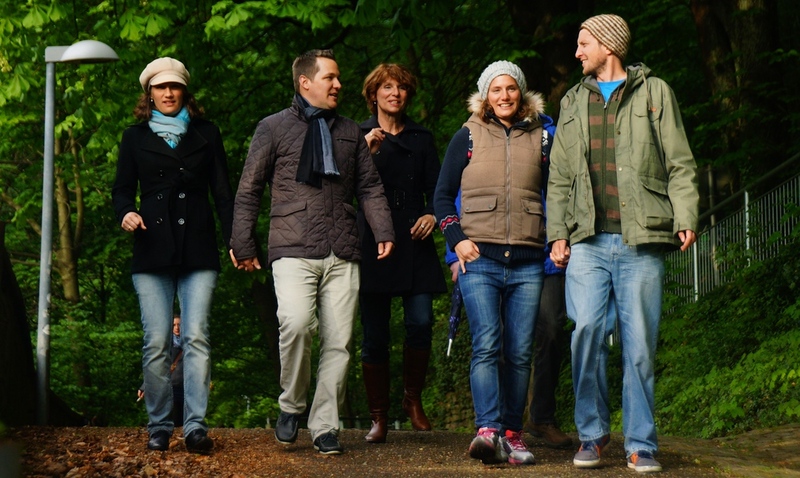 A group of friends enjoying the lovely forest trails on the outskirts of Freiburg, Germany. A typical scene from the Old Quarter – pedestrians and bicycles dominating versus traffic from vehicles. 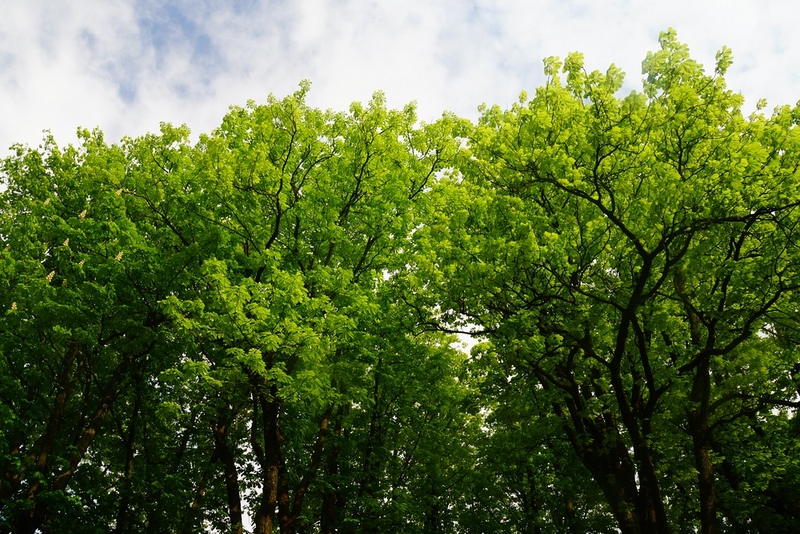 Nothing like the colors of spring in a quiet forest. 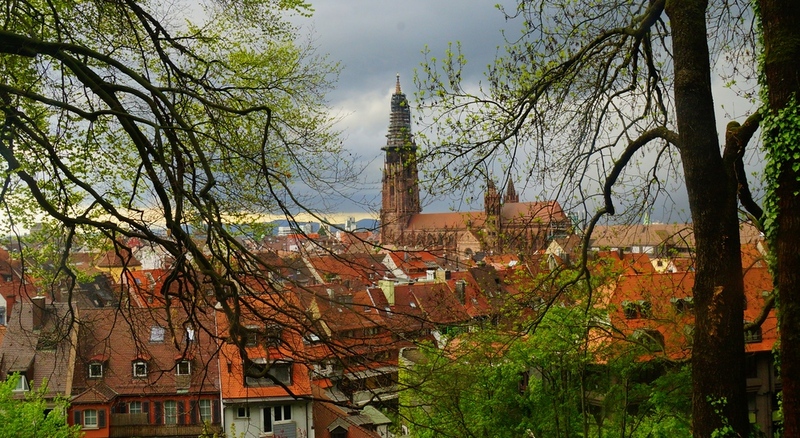 The best views of Freiburg were from the forest trail. Another shot from the same vantage point but zoomed in. As a tip for aspiring travel photographers, use the branches and other aspects of nature as a way to frame your shot. 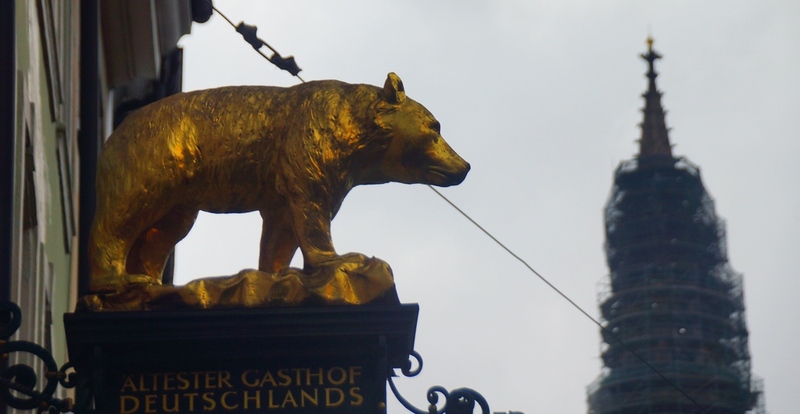 Audrey, who speaks a bit of German, thought this Golden bear says, “The Oldest Guesthouse in Germany.” Upon further investigation we found that this is oldest hotel in Germany and the hotel’s foundation predate the founding of the town in 1120. 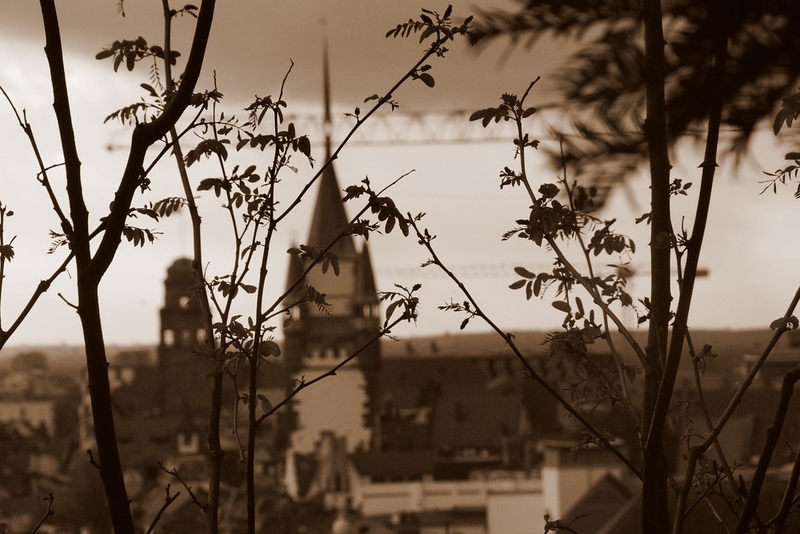 One last shot from Freiburg. I really wish we had a bit more time to explore the city as it was certainly quite charming. 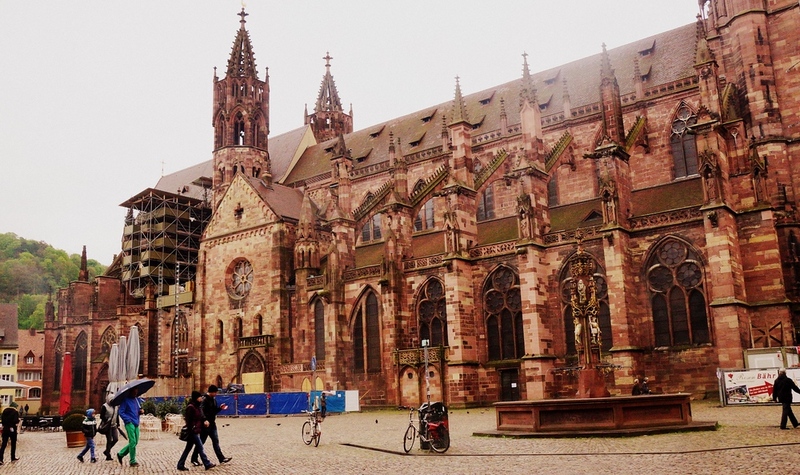 This trip to Freiburg, Germany was part of our post-conference blogger trip one day adventure. Wow…Germany..I dream to be there. One of my uncles is being there…really a lovely place. Especially Dusseldorf. A lot of photos you have posted…I liked the first one. Keep the good work done. Great photos! They very much bring the destination to life! Reminds me exactly of my time living in Germany (Heppenheim) as a student. 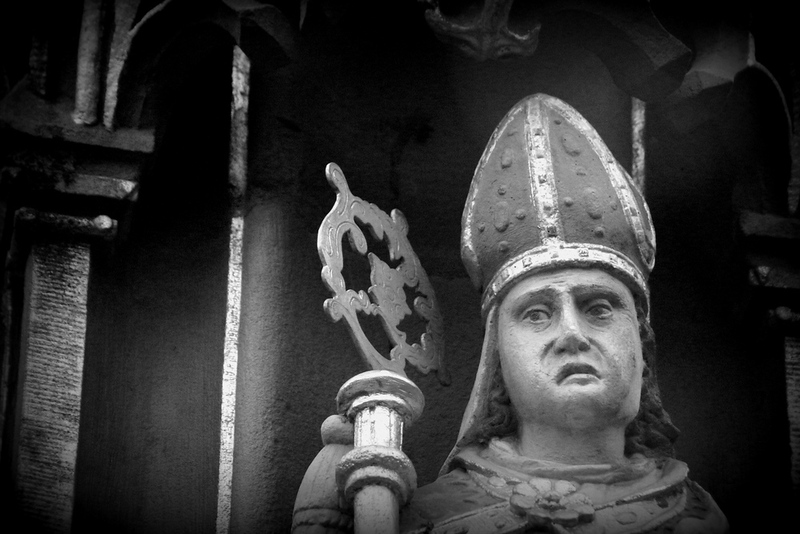 Cool photos Samuel, particularly love the dramatic church on the rainy day. Germany is such a lovely country, can’t wait to go back one day! Thanks Rob! It is a country I hope to revisit again soon as well. I’m glad you got to see some sun! 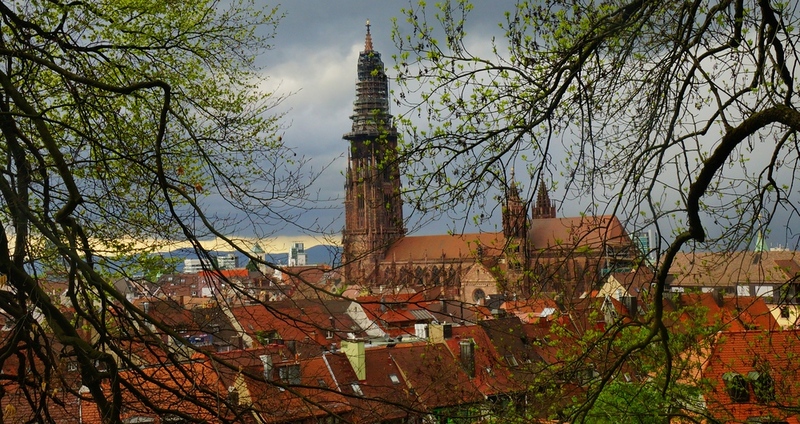 Having lived in Freiburg for almost a year, I think there is a really big difference in how enjoyable the city is to travelers when it rains vs. when it’s sunny out – greater than most places, as it’s very much an outdoors city. This looks like a charming little town. It’s so nice to hear about less popular destinations that I would likely have missed otherwise. I love that shot of the church with the big windows reflecting the cloudy blue sky! Love your street photography, it’s something I need to improve. 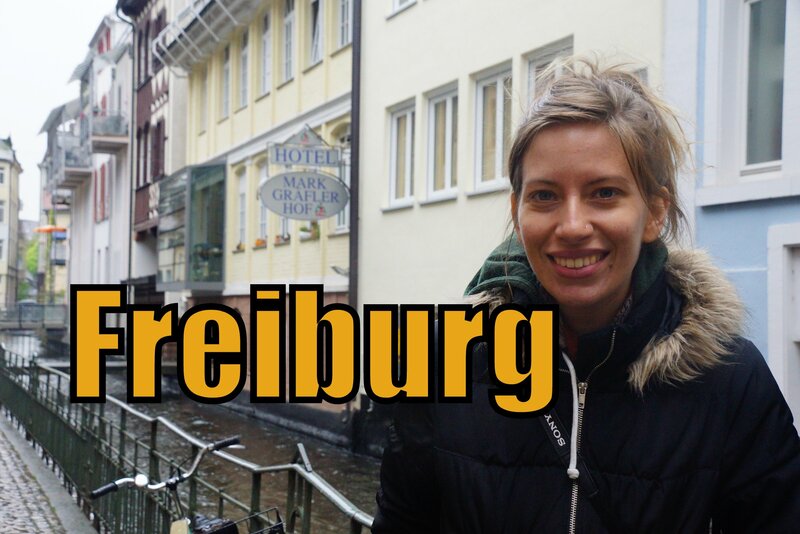 Thanks for showing me round Freiburg! Great photos. It looks like a beautiful place. I’ve only been to the big cities in Germany; I really want to get back there to explore some more. Thanks Carmen! That’s a great idea IMO. Visiting some of the smaller cities in Germany has made me realize how much the country has to offer tourism wise. It’s looks like a really nice little German town. I’ve been to Munich and Berlin but really keen to see some of the small German towns and villages like this one. I’m glad you enjoyed our adopted home city if only for a day. It’s a really nice place to live, and even though the city itself is small and doesn’t have tons of tourist attractions, it’s a popular based for exploring the Black Forest. Sorry we missed you while you were here! I’m German although I live in Japan now. I’ve been to Europa Park when I was a child, but I think I’ve never been to Freiburg – at least not that I can remember. I love your photos, but I just don’t find Germany very beautiful. Maybe it’s because I grew up there and am too used to the buildings and landscape. Interesting to hear about your experiences. Sometimes it is harder to appreciate what you are used to. I kind of feel that way about Canada at times.